Partnership is CVJC”s primary purpose, so we are excited to join with Break the Chains for our next Pray for Freedom event on Saturday, August 9th. Our event will look different than before as we have an orientation the week prior (July 29th) and meet at San Pablo Park on Saturday morning, August 9th to walk and pray. The vision is the same; we are asking GOD to show up and bring his kingdom to the places plagued with brokenness. We are asking his beauty to replace the ashes, and for hope to spring up all over the city. Join us! As we partner with Break the Chains this month, no waivers or RSVP’s are requested but we do require attendance on July 29th for a short orientation. We look forward to this powerful time as we believe unity in prayer moves the heart of God, and our hearts as well. Pray for Freedom/Break the Chains Prayer Walk: Saturday, August 9th, 7:30am, San Pablo Park, located just under the 180 overpass and on the north west corner of Belmont & San Pablo. 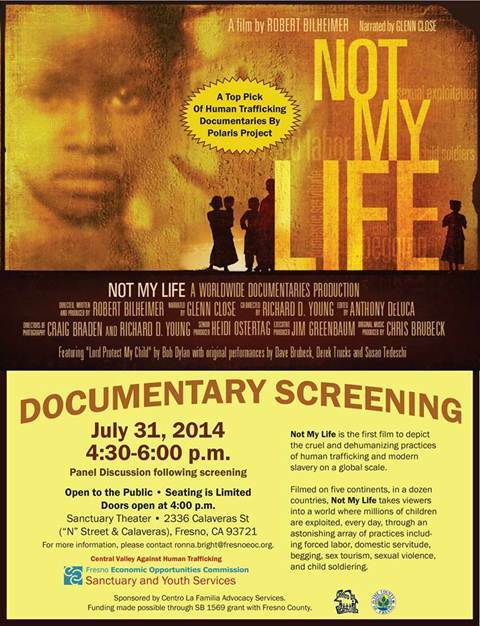 “Not My Life” Documentary: Thursday, July 31st, 4:30-6pm, the Sanctuary Theater, 2636 Calaveras St. Fresno, 93721.